I've been on a bit of a buying spree with games lately. Firstly I bought EVE Online. I played the trial of that on the recommendation of two friends who have been playing the game for about a year. After about 6 days into the trial, the game was looking fun, so I bought it, and began to play it. I got most of the tutorial missions done and the combat ones in particular were quite enjoyable. So I bought the full version for a month, which cost me €20 just to start with, much to my annoyance when Steam put it on sale for €2 a week later. I then joined the corporation (for anyone who hasn't played EVE, these are the guilds/clans ingame) my friends were in. The first impressive thing about EVE is that it is big. Very big. It's also very empty. Both of these were pretty much a given the space setting, but it's still impressive to see it. The emptiness is cancelled out by the Warp Drive, meaning you aren't spending ages staring at black space, yet because you need to use gates to go between systems, the sheer size is still obvious. Trading: Buying stuff cheap, selling it dear. Easy to explain, hard to do well. Mining: Resource gathering. Is there anywhere this isn't boring? Manufacturing: Making stuff. Get x, y and the blueprints, wait some time. Might be OK for some, not for me. Combat: The highlight of the game. This is really quite fun, and well done, as you control all the various weapons/defenses on your ship. Of course, being a noob, I'm still at the sucking and dying stage, so haven't done any PvP yet. A nice feature in game is that skill training takes place in real time, and continues when you are not online, meaning you don't have to play obsessively to get anything useful. I was a bit confused over what to do after the first few days because my two friends who played it went on holidays, but I managed to work my way through it. Learning the game could certainly be easier, but it's not as bad as some people make it out to be. A few things were confusing, but even when my friends were gone, I still didn't find anywhere where I was going "What am I supposed to do now?" However, MMOs really aren't my thing, and while EVE was a good game, I am unwilling to give out €15 a month for it. If it was a game that cost €45 once, and that was it, I'd jump for it. But at over €100 a year, it just isn't worth it. It's a good game, but fails on the area of value for money. Which is something a lot of gaming sites don't always take into consideration. That €15 a month could be spent on getting a new game every 2 or 3 months, rather than just keeping an old game. Another recent purchase was the Introversion Complete Pack, which I bought during the Steam sale for €5. The pack contains 4 games - Darwinia, it's multiplayer successor Multiwinia, DEFCON, and Uplink. The one I've played most was Uplink. Unlike EVE, which struggled to prove its value for money, Uplink alone is worth more than the €5 I payed for the set on Steam. Uplink is a game about hacking (of the script kiddy variety seemingly), where you have to break into various systems by using the right tools. The gameplay was simple, and the game's soundtrack was good, in a retro way. The other one of the set I've played is DEFCON, a RTS based around nuclear warfare. The game starts slowly, as you build up your units and stockpiles, then move them into position, until the timer reaches DEFCON 1, and the nukes start flying. Again, it was quite enjoyable, even if I wasn't that good at it. Though from what I've seen from comments by other people who have played the game, the AI is quite hard to defeat at first. Darwinia, and Multiwinia? I haven't got around to playing those two yet, but the other two have already paid for themselves several times over, so these two should be good as well. The final games I bought recently were Left 4 Dead 1 & 2. Again, I got these in the Steam sales, and given the price reductions, I bought the 4 pack of Left 4 Dead 1 so I could play games with friends when they were over. The co-op element is really fun, and most of the online community is luckily as good as Team Fortress 2, as opposed to the likes of Xbox Live and Counter Strike. I know I'm rather late to the party with this one, but it is still a fun game. The zombies like the Charger and the Tank add the need for extra strategy than the "Get a good weapon and keep shooting while hiding in the corner until they are dead" of my other favorite zombie game, Nazi Zombies mode in COD5 (which was the only reason to play COD5 once you cleared the campaign). The matchmaking system also works very well - I've found myself in matches with players of comparable skill most of the time, rather than being stuck ruining someone else's game by being a noob, or being stuck with people who are even worse at games than I am. Playing locally with friends on Left 4 Dead 1 is fun as well, so the 4 pack was well worth it. The one problem I did encounter, is that the multiplayer element in Left 4 Dead 1 is rather unbalanced in Versus mode if you don't have 8 players, as there are no AI special infected, unlike in Left 4 Dead 2 which had this feature added in a patch. Oh, and the lack of melee weapons is also a bit disappointing. Recently, Linode upped the RAM on all their packages by an average of 42%. My own VPS went from 360mb to 512mb. And yet, the first I heard about it was a RT on Twitter. Considering it's quite a considerable upgrade, almost doubling the RAM, you'd expect them to be shouting it from the rooftops. Most other hosts I have had before this sure would have. Yet I didn't even get emailed about it, so finding out was a pleasant surprise. This reminds me of a contrasting experience I had on a budget shared host. They were using Apache 1.3.37 and PHP 4.4.7. In early 2010. This host was on a website belonging to a client, and it predated me, so moving them to a new host wasn't an option. "If it ain't broke, don't fix it", was their reasoning. And obviously non-technical people don't quite see the problems with having outdated software. Looking through the knowledge base for the host, as they made it really hard to talk to a real person, found that there was a process to get PHP5. So I emailed tech support. They said that it may take some time as the client was on a "Legacy Web Hosting" package. 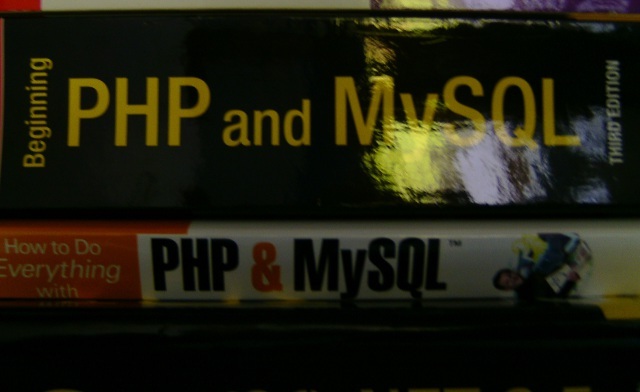 They also strongly hinted that new customers get Apache 2 and PHP5. But old customers? They already have those, so why would they upgrade them? The total opposite to Linode's attitude of "Oh, hello, we've just upgraded your RAM for free." To add insult to injury, that upgrade to PHP5 on the old host took over a month, in which time the ticket was closed incorrectly twice and it was twice hinted that new customers get PHP 5 as standard. Finally, the version of PHP 5 I finally got? 5.1.2. Weren't we all supposed to be using PHP 5.2+ since 2008 anyway? I guess the old saying of "You get what you pay for" is alive and well and definitely applies here. I was talking to Sirupsen on MSN on the subject of simplicity a few days ago. We both agreed that we liked simplicity, yet when we were giving examples, it became clear that we certainly didn't even have the same definition of simple. The biggest contrast came when we discussed Linux distros. I used Ubuntu as an example of simplicity, while he used Arch. Two very different distros both in their aims and their implementation. One of Arch's main stated goals is even simplicity. Yet Arch certainly wouldn't count as simple under my definition. And Ubuntu wouldn't count as simple under his. So, what exactly are these two different, often conflicting, views of simplicity? They're technical simplicity, and usability simplicity. Arch's, technical, simplicity, involves having less. Less done for you, less to install, less to go wrong. But this doesn't nessecarily lead to a simpler user experience. Some of the things they cut out, drivers for certain wireless cards, a GUI, etc are now going to need to be manually installed. Perfect for people wanting total control, not very good as far as an easy install goes. Even their website shows minimalist simplicity. Ubuntu on the other hand is aimed around user simplicity. It's as close to "Press the big buttons" as Linux gets. However, all this user simplicity involves a compromise on the technical simplicity. While it's much easier for the user, the average Ubuntu install has quite a bit more in it that the average Arch install. Some of it is the stuff that you would install anyway - the GUI, a browser, etc. 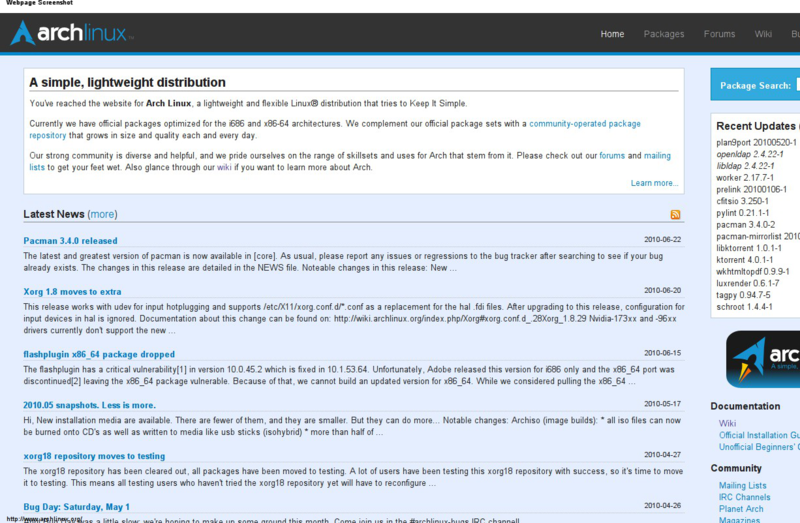 However, it also has three package managers - one GUI, two CLI. The average user won't know about the two CLI ones until they are told about them, so they don't bloat the user experience, but to the technical simplicity crowd, this must seem very wasteful, especially one compared to one on Arch (just pacman). Other things, like the network settings, are done using GUI config tools. And sure, CLIs are normally more efficient, but anyone who says editing wpa_supplicant is easier than the settings panel of wicd or NetworkManager is just bluffing. This article probably shows that I do prefer the Ubuntu emphasis on simplicity of use, rather than technical simplicity. It is possible to have both, but for the most part, that magic of "it just works" takes away from the technical simplicity. Sometimes they align: Twitter is a good example of something that everyone agrees is simple. But other times, like the Linux distros, they don't. So, which do you prefer? 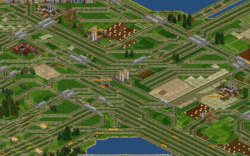 If you've read my blog for a while, you may have noticed that I have mentioned OpenTTD a few times. It's one of my favorite games, and it's well worth playing. If you haven't played it, you can get it from the official website. It used to be a case that you needed a copy of the original TTD game to play it, but with OpenGFX, that is no longer true. Coal -> Power and long distance passenger travel by air are the easiest ways to make money early on. Pay close attention to your slopes and curves. Although the game will allow it, making sharp turns and going up long hills straight away will slow you down, just like real trains. You can grow towns with a few bus stations and buses going around within a turn, which will produce more available passengers. If you want to learn how to play the game really well, I suggest you spectate or play a few games on #openttdcoop. They are very advanced, so if you don't understand what they are up to, don't worry. It is kind of a case of learning in the deep end there, but it does help a lot. While I'm still barely a newbie compared to what they build, most of my friends think I'm really good at the game. Don't ask me why. I certainly don't think so. 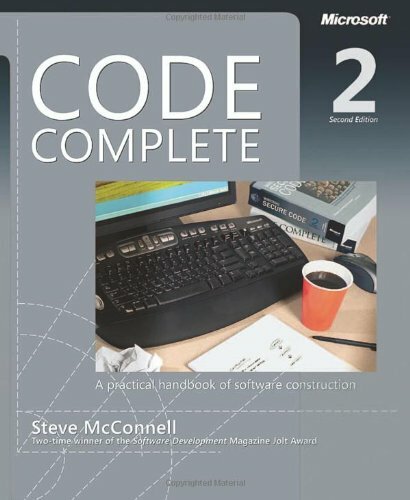 The official wiki, and the openttdcoop wiki also provide a good few tips. #openttdcoop built this. Insane, but mostly simple ideas scaled up. The game has a multiplayer mode, (which is how #openttdcoop build such huge things), which can be played co-operatively or against each other. It's great for LAN games, provided you have a bit of time on your hands. For internet play, you can find loads of servers to play against other people. If you want to just play against your friends over the internet, without joining someone else's server, it can get a bit tricky since someone needs to host it, and firewalls and NATs and all the other issues you normally have do cause problems, because one of you need to host it. I managed to get around it by running it on my VPS a while back, but that's still kind of complicated. I may post a guide for how to do this in a few days.